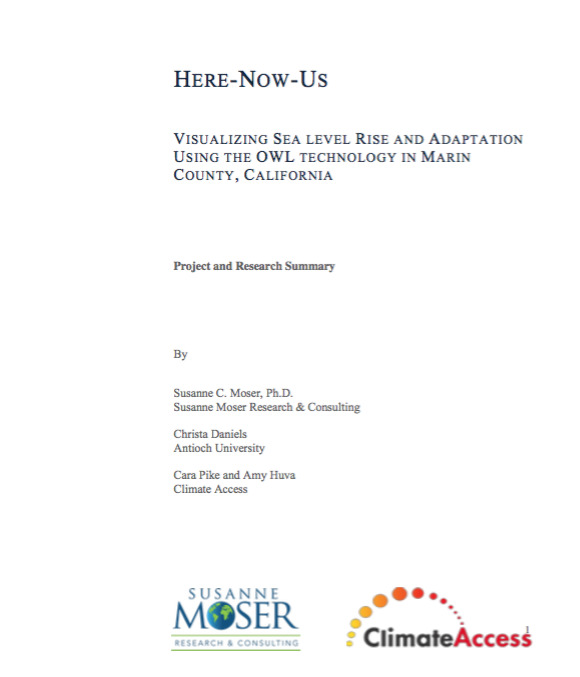 Climate Access, in partnership with the County of Marin, San Francisco-based Owlized and Dr. Susanne Moser used a unique visualization technology enabling community members to be part of decision making processes to help Marin County prepare for climate impacts and build stronger, more resilient communities. What are the specific benefits and challenges of using the OWL technology in climate change engagement? What are the broader benefits of using 3D visualizations in interactive, immersive educational environments for public engagement on climate change? To what extent do visualizations, followed with a deliberative dialogue process, help increase awareness and efficacy of localized climate change risks and solutions options? Scenario 1 – "Current Condition": Illustrated current storm and flood conditions already experienced in the area from sea level rise. Scenario 3 – "Sea level Rise/Seawall": Illustrated a potential near-term protective adaptation response to the sea level rise from Scenario 2. Scenario 4 – "Sea level Rise/Green Infrastructure": Illustrated a different potential near-term protective adaptation response to the sea level rise from Scenario 2. Participants were given two adaptation options, the seawall and the eco-berm. A small percentage of users, 14%, wanted to learn more about the seawall option, while twice as many people 26% wanted to learn more about the eco-berm option. The largest segment (27%) wanted to learn more about both options. Owl users were asked a series of questions about future engagement in relation to seal –level rise after their experience with the project. 15% users wished to have no further involvement in the adaptation planning process where as 29% indicated they would like more information. The Owl project used a series of Chi-square tests to determine device users level of concern in relation to further engagement. The test showed a strong relationship between an increased level of concern participants expressed about future seal –level rise and engagement. The city of Marin County wanted to know the level of concern different age groups showed towards adaption. An overwhelming 90% of all the five age groups showed interest in learning more about adaptation options. Audio recordings were taken on site at the OWL Project’s viewing devices to provide insight on participant’s perception of the project. The 121 usable recordings showed that both adults and children expressed gratitude for the project.